Facebook. Have you heard of it? Probably not, because Pipeburn prides itself on keeping a firm finger on the pulse at all times. Which is why we are happy to announce that we have started something called a ‘Facebook Page’. You should check it out. When you go there hit the small button called a ‘Like’ button. 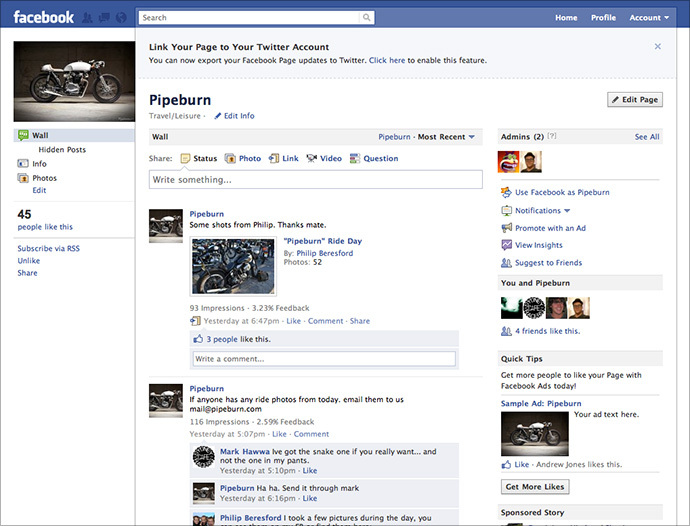 Then you will receive all the latest motorcycle goodness from Pipeburn and it will also make us feel like you care. You do care, don’t you? PS. We’ll be posting some pictures of the Pipeburn Meat Burn & Burn ride soon, but if you just can’t wait to get a whole bunch of photos of sweet custom bikes and grown men playing with dead snakes, head on over there for a preview.